Businesses and individuals enter into contracts all the time. A contract spells out the promises made by each party that is enforceable under the law. When both parties fulfill their end of the bargain, the contract may no longer be an issue. However, if either party fails to fulfill their side of the bargain, their contract dispute could lead to legal action. Contracts can involve a simple agreement between two people or they can involve a document that is a dozen pages long requiring separate agreement by multiple parties. They can involve boilerplate language from a form printed off the internet or they may be drafted by a team of lawyers to include almost every possible contingency. When something goes wrong, a contract dispute can be just as simple or complex, depending on the situation involved. When the parties enter into a contract, they may have both intended to comply with the agreement. However, circumstances may have made things unprofitable or impossible to comply with the agreement. As a result, one party may try and back out of the contract, make changes to the agreement, or try and avoid their obligations. Mistakes, misunderstandings, and missing terms can also create problems in fulfilling a contract. A contract involves an initial offer and acceptance of the offer. However, in contract law, even the offer and acceptance can be in dispute. The parties may dispute whether an offer was made because the terms were not certain or definite, or the purported offer was intended to be an advertisement or a request for bids. The acceptance may also be disputed if it was not timely, the offer was retracted, or if it was considered to be a counter-offer. When one or both parties recognize a change in circumstances that may affect how the contract is carried out, they may seek to change the terms of the contract. Modifying the terms of the contract can avoid a breach and provide a way for the parties to go forward in light of the changed circumstances. For example, if a material is no longer available for manufacturing a good, the parties can agree to use a substitute material instead of having the manufacturer deliver non-conforming goods. In order to modify a contract, all parties must agree to the proposed changes. The process for modifying a contract may already be spelled out in the terms of the original contract, or the parties could even agree to terminate the contract and negotiate a new contract. If the parties cannot agree on changes or modifications, the original contract may still be in effect, with all available remedies in the event of a breach of contract. A breach of contract involves failing to perform under the terms of the contract. This may involve not paying an agreed upon price, not delivering goods, not performing contracted work, failing to pay rent, or selling a product to another party. In some cases, showing that the individual intends to breach the contract may be considered an anticipatory breach. When a breach of contract occurs, the party seeking to enforce the terms of the contract may be able to take legal action. The remedies available after a breach of contract may depend on the type of breach. A breach can generally be classified as a material breach or a minor breach. A material breach results if the non-breaching party does not receive the substantial benefit of the bargain. Once a material breach has occurred, the non-breaching party can treat the contract as coming to an end and immediately seek all remedies provided by a breach of contract. The remedies will depend on the nature of the contract and what damages are allowed under the contract. The remedies for the minor breach or partial breach may depend on a number of factors, including the extent of the breaching party’s performance, whether the breach was intentional, how much of a benefit the non-breaching party received, and the extent to which the non-breaching party can be compensated. Arbitration clauses are increasingly included contracts, especially contracts drafted by only one party. 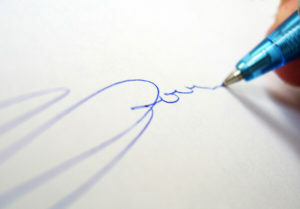 An arbitration clause provides that if there is a contract dispute, the parties will seek private arbitration instead of being allowed to take their case to court. Arbitration is a form of alternative dispute resolution. In arbitration, a neutral third-party, the arbitrator, looks at the evidence, hears from both parties, and comes to a final decision. In many cases, arbitration can be better for all parties involved. Arbitration is generally quicker than going through the court process and may save on legal costs. Arbitration is also more flexible than the courts and the arbitrator can craft unique remedies that are appropriate for both parties as opposed to the limited judgments available in civil court. However, in some cases, arbitration may be more one-sided, benefiting one party over another. If a large company makes a single consumer agree to licensing or contract terms without allowing meaningful negotiation, the company may put an arbitration clause in the contract. This limits the legal remedies of the consumer, who may find the cost and terms of arbitration make it too difficult or expensive to go through with their dispute. If it looks like another party will not be able to fulfill their side of a contract, if they have already breached the contract, or if you become unable to complete a contract, talk to a contract dispute attorney about your case. Your experienced Colorado contract dispute attorney will evaluate your case, identify your options, and represent your side in settling the contract dispute. If you have a contract dispute with an employee, vendor, or another company, the Olson Law Firm will help you get the resolution you bargained for. We have successfully represented our clients in contract disputes, business disputes, and civil litigation. We will provide you with the personal attention you expect and deserve and always keep the lines of communication open. It is our dedication and commitment that makes the Olson Law Firm one of Colorado and Wyoming’s preeminent law firms. Contact our office today.